BAGHDAD, Iraq (CNN) -- A suicide bomber detonated an explosives-laden truck in a crowded Baghdad market Saturday, killing at least 128 people and wounding 343 others, a Health Ministry official said. The blast, which destroyed nearby buildings and vehicles, occurred in Sedriya, a mixed neighborhood of Sunni Arabs, Shiites and Kurds. Many people were still trapped under the rubble, and news footage showed myriad victims being wheeled on stretchers into hospitals. The immense number of wounded forced hospitals in the area to redirect patients to other hospitals around the city. The Health Ministry official said the death toll was likely to rise significantly. Jihad Jabri, head of the Interior Ministry's bomb squad, said the Mercedes truck used in the blast contained a ton of explosives. U.S. Ambassador to Iraq Zalmay Khalilzad called the bombing "an example of what the forces of evil will do to intimidate the Iraqi people." He said that people who carry out such "heinous crimes" are going to be "relentlessly hunted" until they "are apprehended and brought to justice." Saturday's bombing comes a day after a U.S. intelligence report was released that describes the task of brining stability to Iraq as "daunting," and on the day when Grand Ayatollah Ali al-Sistani, the chief Shiite religious authority, chose to address Iraq's sectarian strife. The blast was the deadliest attack in Iraq since November 23, when Shiites were targeted by coordinated car bomb attacks in Sadr City. At least 200 civilians were killed then. Violence Saturday was not limited to the central Baghdad market. Nine bombs went off within two hours throughout the northern city of Kirkuk, the deputy police chief there told CNN. At least two people were killed and 20 wounded, he said. Police imposed a curfew in the city and closed all roads into the community. The curfew is expected to be lifted at 6 a.m. Sunday. A car bomb killed one and wounded six in Mahmoudiya, south of Baghdad, authorities said. And back in Baghdad, a passenger was killed and four others were wounded when their minibus struck a roadside bomb in eastern Baghdad's Beirut Square, the Baghdad police said. The minibus was headed to Sadr City. More violence was reported Saturday in Samarra, where insurgents last February set off bombs at a sacred Shiite mosque, igniting a wave of sectarian violence. On Saturday, four police officers were killed when at least 20 gunmen in six vehicles attacked a national police checkpoint, prompting authorities to ban vehicles in the city, Samarra police said. Three officers were wounded in the attack. The U.S. military on Saturday reported six American troop deaths in Iraq -- five on Friday and the other on Tuesday. On Friday, two died in a roadside bombing south of Baghdad, two in combat in western Iraq's Anbar province, and one of "apparent cardiac arrest" after a physical training session. The soldier who died Tuesday was on a two-week "rest and recuperation" leave. The military did not say where or how the soldier died. The number of U.S. military personnel who have died in the Iraq war stands at 3,089. Seven civilian contractors have also been killed. Iraq's government spokesman said Saturday that more than half of the foreign fighters carrying out bombings and killings in Iraq enter through Syria. Ali al-Dabbagh made the comment to CNN after he spoke about the matter on Iraqi state TV Saturday. Syria has said it is trying to deal with the problem. Al-Dabbagh acknowledged the Syrian government's efforts but called on it to tighten control of the border. He added that "some in the Syrian leadership are supporting the Saddamists and the forces of terror." CNN's Mohammed Tawfeeq and Jomana Karasheh contributed to this report. 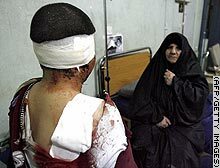 A woman looks at a wounded Iraqi youth at a hospital Saturday in Baghdad. Hospitals were overwhelmed with casualties.